Generally speaking, offensive decks tend to focus on one type of attack over another. This is especially true for stage based beatdown, which needs to create a critical mass of stage loss in order to accomplish actual Life Deck damage. Mixing attacks can also be useful or necessary, but only some Styles can successfully take that approach. With the release of Dragon Ball Z: Evolution, Vegeta introduces a powerful new archetype of hybrid beatdown. 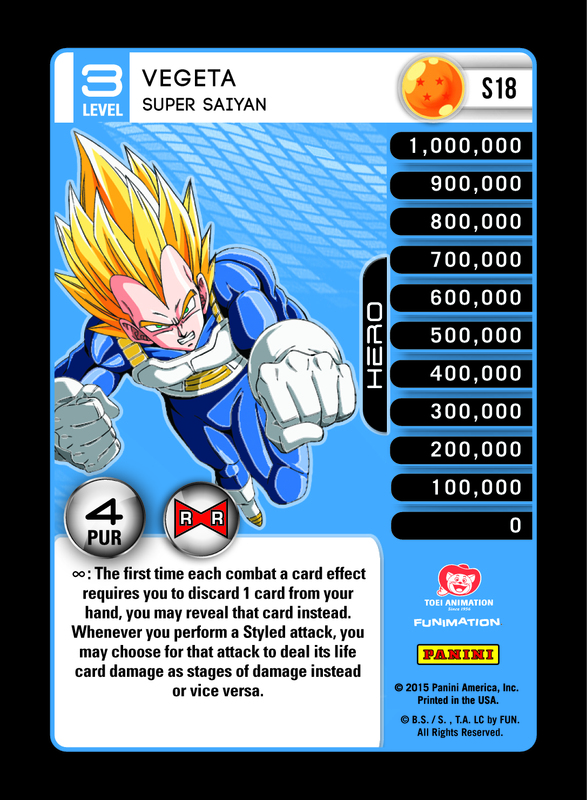 Vegeta’s first three Levels all contain abilities that convert life card damage into stages, and on Level 1 you’ll be able to do it once per combat. Now, stage based beatdown decks are able to play utility cards like Orange Stare Down while still augmenting their normal damage route. Similarly, decks heavy on physical attacks will reap huge benefits from running a “greatest hits” attack package without worrying about efficiency. Orange Power Point for 7+ stages? Yikes! His other ability has obvious applications with several Masteries, and provides some early game hand advantage to keep up with action based MPs. 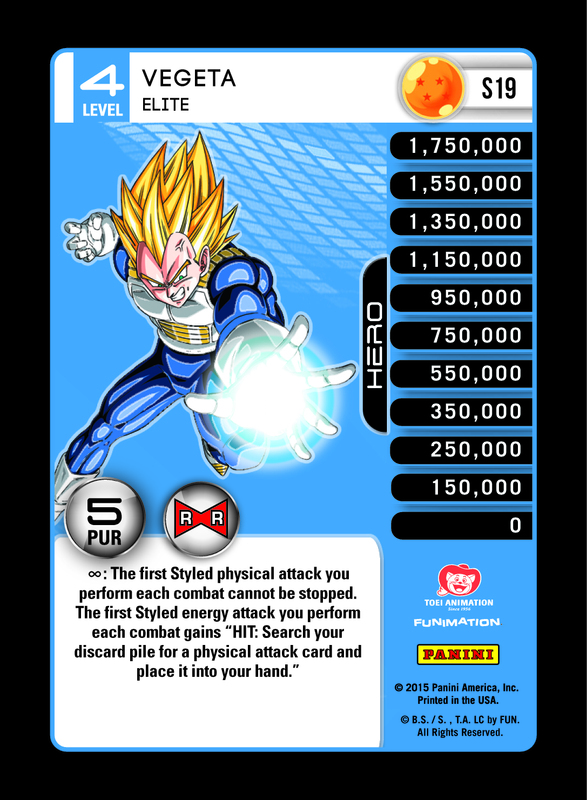 “Vegeta – On the Move” extends the conversion ability to all of your Styled attacks, and also tacks on a physical attack for 4 Life Cards of damage. On Level 3, you’ll regain access to the reveal ability – with the added bonus of protecting against opposing discard effects! 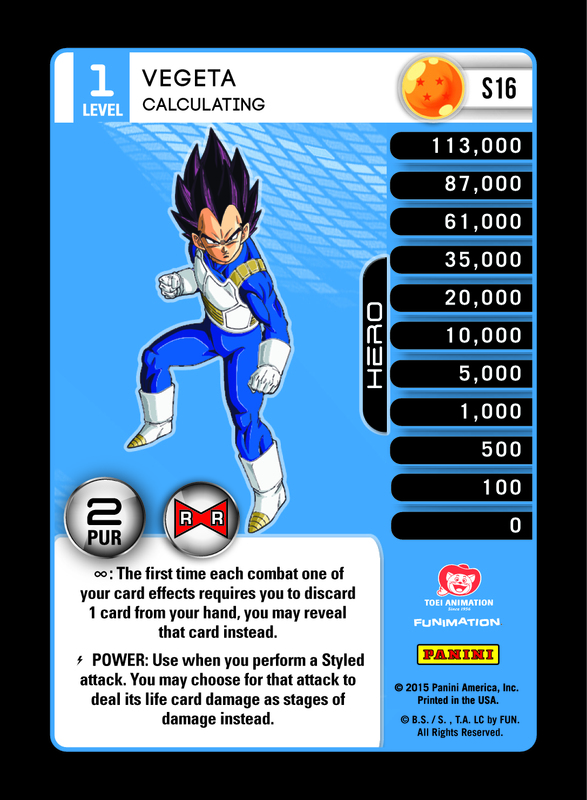 Vegeta can continue aggressive stage pressure, but also has the option of throwing haymakers by converting stages into Life Cards! This can be highly efficient in any situation, but it provides some interesting counter-plays around a field Allies or other defensive board states. Many Level 4s can end the game quickly, but Vegeta – Elite is truly an engine of destruction. 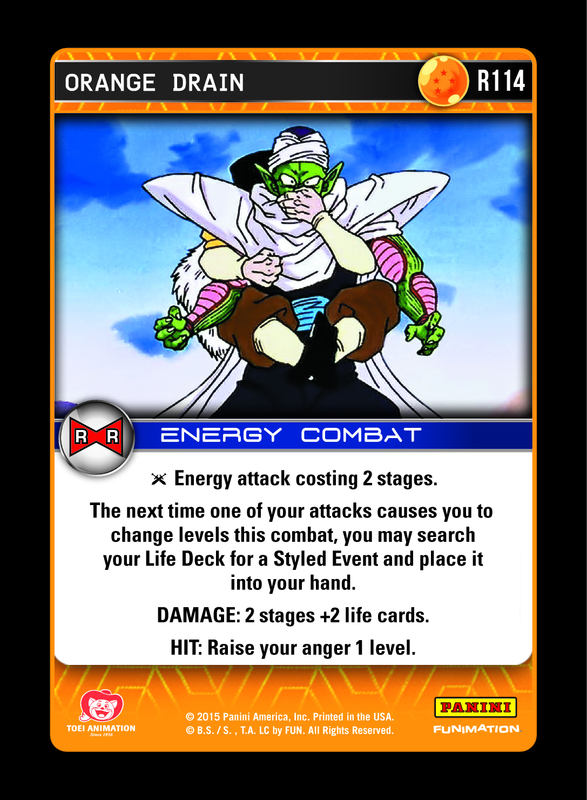 Aside from making your first Styled physical unstoppable, he is able to recur the most damaging attack in your discard pile simply for landing an energy attack. 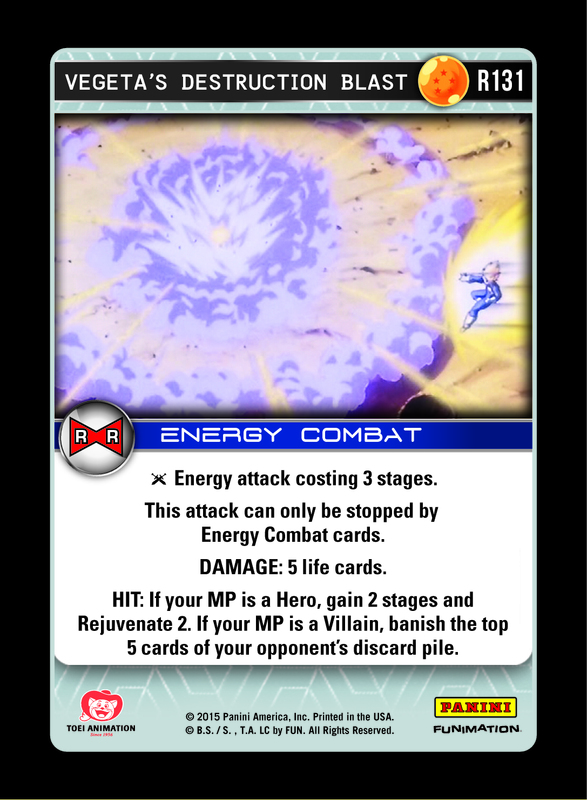 Though Vegeta cannot mix and match MP Levels due to opposing alignments, all of his named cards are available to either stack. Vegeta’s Destruction Blast requires an honest defense from your opponent’s hand, and the HIT effect has huge upside regardless which mode you receive. Between this and Galick Gun, Vegeta’s Named attack package is second to none. 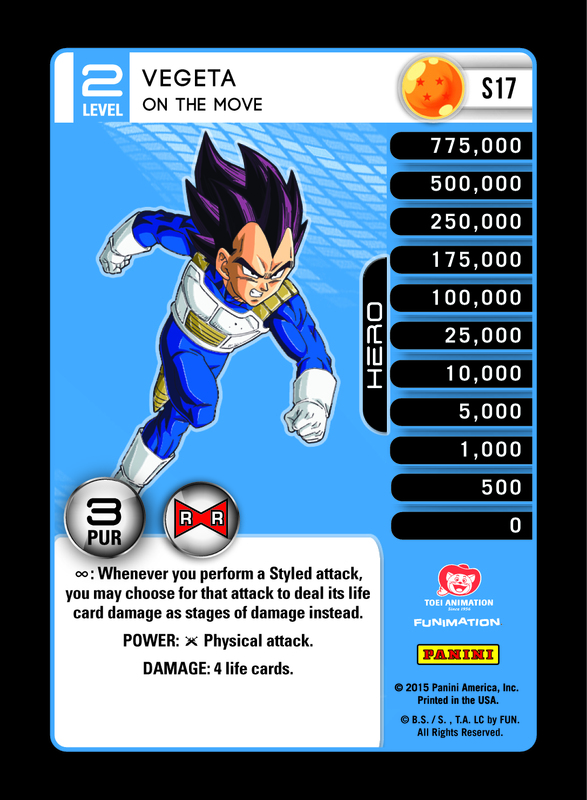 Vegeta comes with the Orange Adept Mastery, and his abilities mix well with its damage modifier. Orange Adept Mastery grants a constant +1 stage of damage to all attacks, energy or physical. 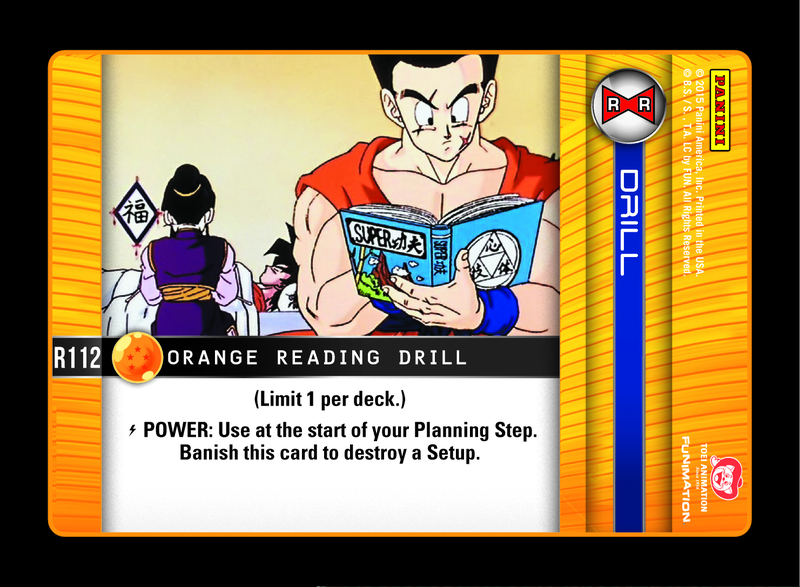 While this greatly enhances Vegeta’s plans, the bonus is a welcome addition to any Orange physical deck. Next, your successful Styled attacks can search out any constant drill – as long as you have less than three in play. If you’re trying to pump out damage, you can quickly pull more damage modifiers like Orange Disaster Drill or Orange Aura. At the same time, the searching effect allows you to find key utility cards, such as Orange Driving Drill or Orange Investigation Drill. You’ll notice several effects (both past and present) that allow you to fall under your drill threshold in order to search out something different. The ability of the Mastery to Rejuvenate a drill after leveling makes sure that you have plenty of targets to search back out, and leveling up is another quick way to get back under the threshold. To get the most out of this Mastery, you’ll want to be doing things in combat frequently. 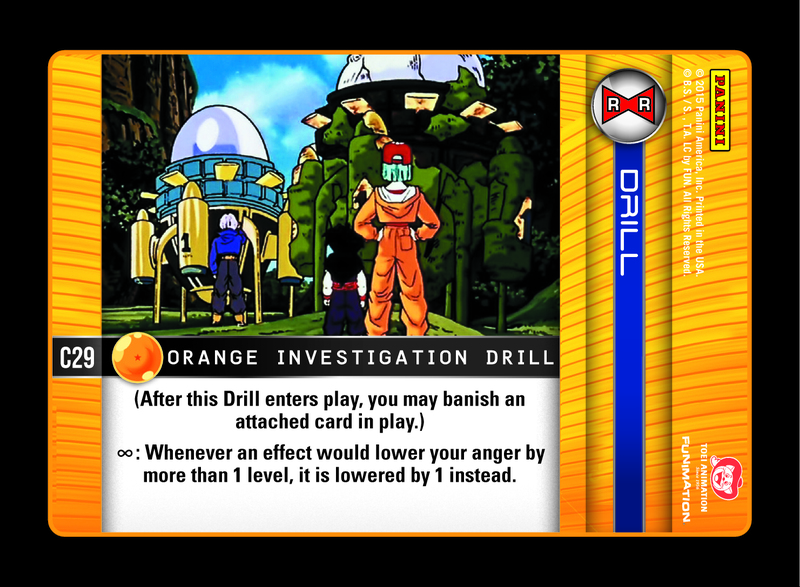 Orange Investigation Drill is a great candidate for any Orange Adept deck attempting to slime level. Orange Drain allows access to a Styled event, but with the condition of advancing through an attack. While this has natural synergy with the new Mastery, there are some interesting applications in older control decks as well. 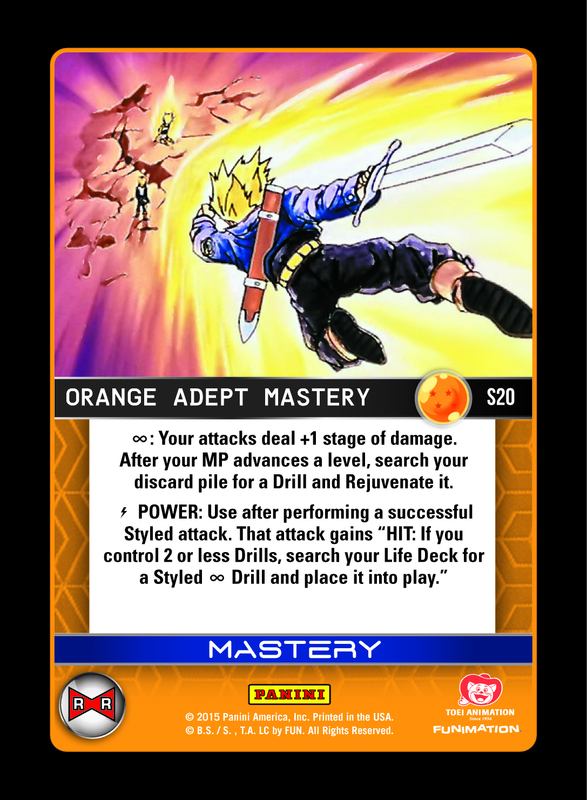 Orange Reading Drill finds itself more at home in Orange Adaptive Mastery decks that are looking to gain a leg up in control matches, but it is of interest to aggro as an out of combat answer to cards like Visiting the Past or Namekian Wish. This is a new twist for the orange style. It was hard having physicals with set 1 mastery because you could not benefit from the +1 to energies. This opens a whole lots of possibilities if you go hybrid or full physical/energy. This new vegeta ensures that +1 to benefits all types of attacks. So exited!! Vegeta was and is my fav character. Yeeeeessss!!! I like this vegeta set. The new orange mastery looks like it will be fun with Turles. +3 stages on all styled attacks, and no endurance at level 1 plus whatever you get from drills. After not being a fan of the Goku changes, I am pumped for these Vegeta Changes. I love aggro decks, and Vegeta looks like he will fit well with either orange or Saiyan styles. The real hard part for me is whether I should keep my previous Goku Orange deck, or gut it and make a this Vegeta a hybrid Orange with the new mastery. The problem with new MPs is the powerlevel creep makes it hard for physical beatdown to be possible with older MPs. Though we haven’t seen the new AT so this may not be a huge deal. I like this preview. Only complaint: Why isn’t it just called Vegeta’s Big Bang Attack? 😦 or just Vegeta’s Big Bang. Yeah indeed. It’s just a little thing but still.. important for me. I do believe that panini got this one right can’t wait to see the other mastery and if there are any more discarding effects coming. I am just too excited to see this new vegeta in Saiyan style. It would be a game changer for Saiyan to have a card advantage based mastery though!!! !